At last, a new tennis technology that everyone can enjoy! I’m talking about the HEAD® Tennis Sensor powered by ZEPP®. This is a new performance-tracking device that helps you learn more about your strokes and improve your tennis game. Head’s software is specifically designed for any Graphene XT, Graphene Touch or MXG tennis racquet. The tennis-specific racquet device measures your stroke type, ball speed and spin, calories burned, and playing/rally time. This information is then sent to you through one of the many compatible devices (iPads, iPods, iPhones, Androids and Bluetooth 4.0 and newer) to the HEAD sensor app. You can use this data to analyze the progress of your game, study your performance with your coach, and compete with your friends. After seeing sensor technology change over the years, I was very excited to hit the court and see what it could really do. The app can only be used with mobile devices, so you cannot download the app to your laptop or computer. This is an area that should be explored more in future devices because players should be able to download their data and transfer it to their home computer or laptop for further game improvements. Data from the app cannot be shared on social media platforms. Most players like to show off their stats when playing, so why not make it easier for the user to do so through social media. Many apps for phones or tablets have this feature already. Once you get everything connected, the sensor is very easy to use. The Play section allows you to see different stats as you are hitting. It shows how long you played, how many calories you burned, how many times you hit certain strokes, how many hits were with spin, how often you hit the sweet spot, and how fast you hit the ball. The only time the sensor gets confused in this setting is with Serves and Smashes mostly due to the same swing motion. Otherwise the sensor is very good about differentiating between strokes and spins. Below you will see snapshots of the Play Section and what my stats were during that session. In the Train section, there are different videos that are focused on helping you improve specific shots. The app can also individualize your training videos and recommend topics that fit your needs. This is a nice feature if you don’t have a coach or you’re working on a specific shot. What is very beneficial about this section is the in-depth directions the app gives you. You will not only see the demonstration video, but also get specific descriptions for each step. Below you will see snapshots of the Train Section and what it looks like in the app. In the Compete section, you can play against anyone and record video of each point so that you can analyze your game later. You will need at least one sensor to record a singles match and two sensors to record a doubles match. This section is good for players who want to analyze how they play against certain opponents. This feature allows you to break down the video point-by-point or shot-by-shot to analyze your game. With a battery life of 5-6 hours, the sensor can easily record 1-2 matches before needing to recharge. Below you will see snapshots of the Compete Section and what it looks like in the app. Finally, there is Practice Serve mode. This is a unique setting that allows you to see a 3D image of your service motion and analyze statistics about your serve. This is my favorite feature because you get to see how you swing on each serve, so you can change certain aspects of your swing based on what you see. Two negative aspects are that you can’t see where the ball lands and you can’t record video in this mode. However, you can look at many different angles of slow-motion replay for each serve you hit. A 3D rendering shows you where you make contact with the ball, where you start and finish each swing, and the swing path of your serve. Below you will see snapshots of the Practice Serve Section and what my stats were. 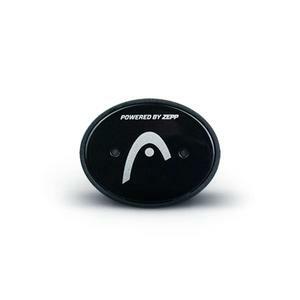 HEAD® and ZEPP® designed a very good product that can be used by many different players. The product can only be used with new HEAD tennis racquets, but it did make me want to switch racquets just so I can test it out further and analyze more features of my game. I liked many different features of this sensor – especially the Practice Serve setting — and it stands out from the other racquet sensors on the market today. For just $99.95, the HEAD Tennis Sensor is a steal for any players who are serious about taking their game to another level. Visit tennisexpress.com today to purchase your HEAD Tennis racquet and sensor! Also check out our blog page for the latest players using HEAD Graphene Touch racquets!